Online application forms can be found and submitted here! SMILE is a music playschool for children aged 3-6 (and sometimes even younger!). It aims to inspire a profound love and enthusiasm for music by immersing young children in a rich musical environment whilst also contributing to their overall development and wellbeing. 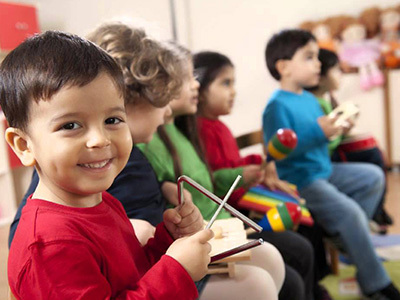 It offers a variety of music playschool activities. 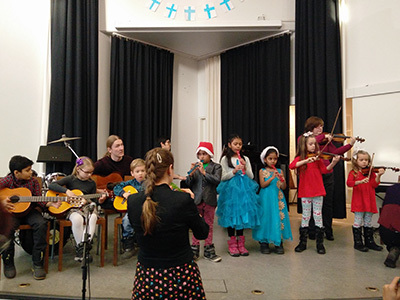 We have family groups, music playschool groups, pre-instrumental groups and music carousel groups. Read all about what we offer below. In our classes, your child will develop and build basic musical, social, emotional, cognitive, and psychomotoric skills through singing, playing, listening and moving to music. We offer packages of 5, 10, and 15 lessons to a number of playschools/daycares. If your playschool/daycare is our partner (see the list of locations here), group lessons are held at your child’s own playschool/daycare. We also offer lessons at our own Studio for anybody who is interested. Target-oriented and versatile activities tailored to each child’s age and development. Family groups for children aged 0-2 yrs old with an adult can be formed upon request. Lessons will take place at our Studio. Groups will be established if there is minimum of 5 participants. Orff’s method combines music, movement, drama, and speech into lessons that are similar to child’s world of play. It was developed by the German composer Carl Orff (1895–1982) and colleague Gunild Keetman during the 1920s. Dalcroze’s method teaches musical concepts, often through movement. The variety of movement analogues used for musical concepts develop an integrated and natural musical expression in the student. Turning the body into a well-tuned musical instrument—Dalcroze felt—was the best path for generating a solid, vibrant musical foundation. 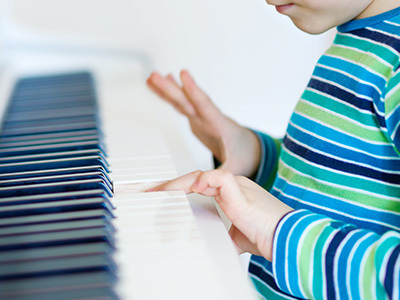 A music teaching method based on the child’s experience, his or her sensory perception, affectivity and mental state. This method develops the child’s listening ability, sense of rhythm, motivity, memory and concentration. It helps to develop the child’s musical qualities, to help the child open up and prepare him or her to play an instrument. Pre-instrumental music lessons introduce children to the world of music by promoting basic musical skills in a fun and encouraging way. We offer group lessons for single-instruments and multiple instruments (“Music Carousel” lessons). If your school is our partner, the group classes take place at your child’s own school. 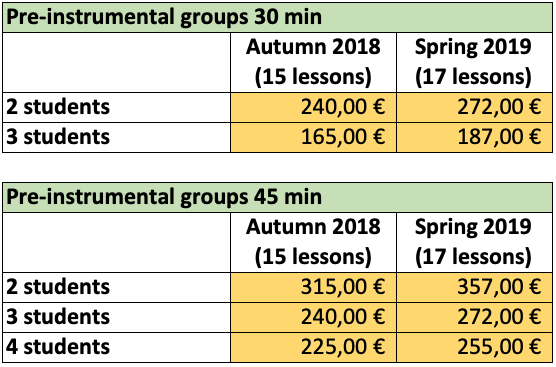 Otherwise, we also offer group lessons at our Studio. Instruments for this autumn’s carousel are violin, piano, recorder, and guitar. All instruments are provided for carousel lessons. 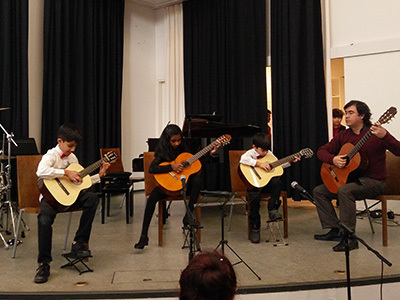 We offer pre-instrumental students the opportunity to take lessons on instruments provided by the school, but it is not possible to take these instruments home. For home practising, we recommend students buy or hire their own instruments. We can help you find good, affordable instruments. Just let us know.